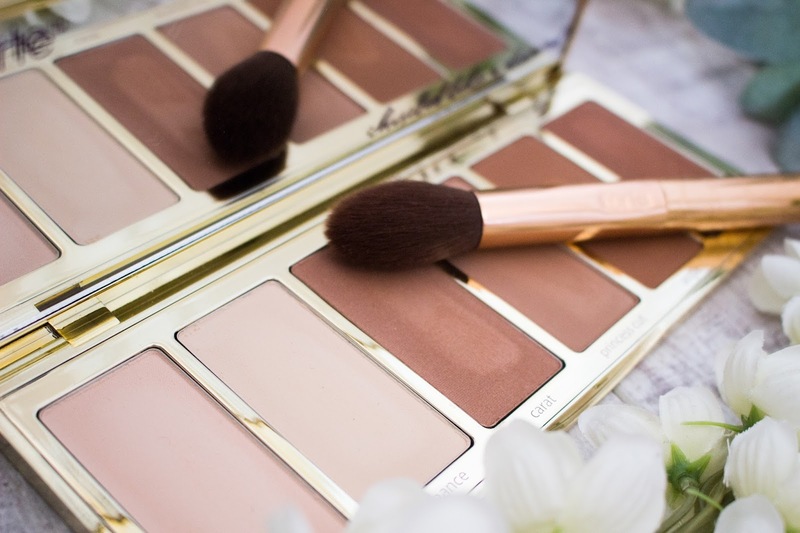 I am currently writing this blog post outside in the garden enjoying the sunshine (finally it is warm in the UK) and what better product to review that a contour palette that can help achieve that bronzed Goddess look that I always want in the warmer months. Tarte is a brand that I have a mixed feeling about; there are some products that I really love and then there are products that I don't use that often. Plus, Tarte have definitely gone through some controversy over the last couple of months over their shade selection for some products but when I saw this contour palette I was really excited to try it out as it looked like a palette that can be used by all skin tones, from the photos posted. When it comes to contour, I am still a bit of a novice and I must admit that I tend to use bronzer more than contours as a lot of contour products can look muddy or dirty on me and that is definitely not a look that I am usually going for. 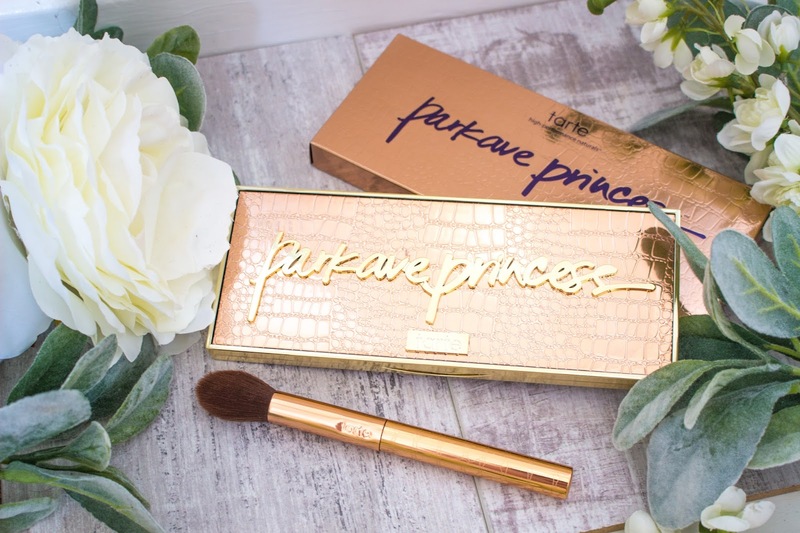 However, when I saw that Tarte had released a Park Ave Princess contour palette at the end of last year, I knew I wanted to try it as I had heard so much about the Park Ave Princess bronzer. I also saw from the photo that it looked like there were some shades that would be perfect to use as a bronzer as well as a contour shade. This palette was just everything that I was looking for as I knew I could use it as a bronzer, contour and as an eyeshadow palette. I have read multiple reviews about this palette first, before I purchased it, and there were some mixed reviews about this product and I must admit that I do agree with some concerns surrounding this product which I will explain later on in the post. Tarte is a brand that is not easy to purchase from in the UK; you either have to buy directly from the Tarte website or from QVC. This palette is available from both websites and it retails for £40 from Tarte and £33 from QVC. I decided to but this palette from QVC as you do get a brush included in the price which is also a great brush to have in my collection. Firstly, I have to talk about packaging; I know I always say that packaging is not a reason why you should buy a product but I am instantly drawn to anything that looks pretty or is shiny. The packaging of this palette is something that you are either going to love or hate and I happen to love it. At first I did think it didn't look that nice on the photos I had seen but it is a lot better in person. The palette is just a plastic case which is encased in rose gold snake effect print and then edged in gold. The name of the palette is also in gold on top and it does look really pretty on a dressing table. I am not usually someone who likes snake effect prints but I do like it on this palette and I am a sucker for anything rose gold. Even though the powders are encased in a plastic case, it does feel durable and pretty sturdy - so you know that it is not going to break easily. I love that there is a huge mirror in the palette as well which means it is perfect to use when applying makeup as you can really see where you are applying everything. The palette, itself, is very large and the pan sizes of the powder products are a really great size. Usually I find that the pans are too small in contour palettes, but with this one you can fit really large fluffy brushes in it - which is a great bonus! I will say that this palette is not very travel-friendly. As much as I love how big the pans are, it does mean that the palette is very long although it is not bulky (it is a normal size for a contour/eyeshadow palette). As it is such a long palette, I do struggle to find a makeup bag that will fit this palette and even when I can fit it in, I cannot fit as much as when I take a small contour palette. This is not a huge criticism as I don't always take a contour palette with me when I am travelling but it would be handy to have it be a bit smaller as I would use this in the place of multiple products. But I would rather have bigger pan sizes than worry about being able to fit it into a makeup bag! Halo - A pale ivory matte shade with a pink undertone. This shade works best on me as a setting powder that I can use to set my under eye concealer. It helps to brighten my skin and leaves it looking smooth. I find that a dense brush applies this powder perfectly and I would not recommend using a BeautyBlender as it does not give any pigment and looks sheer. Enhance - A warm yellow undertone matte shade. This is a powder that I cannot use under my eyes to brighten as it is too yellow on me, but I do like to use this as a setting powder all over my face as if I use a small amount it is not too yellow and can work well with my skin tone - it just does not add any brightening effect to my skin. Carat - A medium brown shade with warm orange undertones in a shimmer finish. Even though this is a shimmer contour, it is not glittery and just gives a natural healthy glow to the skin. This is the lightest of the two shimmer contour shades and is perfect for adding a natural warmth to the skin without being too orange. Princess Cut - A light matte brown with a cool undertone. This is a shade that I love to use as a contour as it is the lighter of the two matte shades. It is also really easy to blend out and you can definitely build up the pigmentation. Angle - A matte medium brown with warm undertones. This is a beautiful bronze shade that is perfect for warming up tan complexions or I also like to mix it with Princess Cut to make it slightly lighter for when I am more fair. This is a very pigmented shade but can easily be blended out to make it more natural. Crown - The darkest of the four contour shades with rosy undertones and a shimmer finish. This is a shade that I don't use that often and when I do I only use a small amount on my brush as it can look too dark on me when I am at my fairest. I really like the fact that when they chose their shades they did choose a light and a dark shade for each type of powder; for the matte shades, shimmer shades and the two highlighting shades. It does feel like they tried to make a palette that would be great for a lot of skin tones (although I think it would have been better to come out with two separate palettes, so everyone is included). I feel like all of these shades work well if you have a fair skin tone to a tan/medium skin tone. However, if you have a deep skin tone, I don't think any of these shades are going to work well at adding any contour. I did read a review where the blogger had a medium/deep complexion and she stated that she could wear some of the shades but anyone with a deeper complexion than hers would really struggle with this palette. Therefore, I think they could have added a deeper contour shade or they could have brought out two palettes instead. When I looked at the palette, I thought that there was not much variety in shades and that they all looked very similar to each other; especially Carat and Angle. However, when I swatched them on my hand and used them on my face, I can definitely see that there are different undertones to each powder. I do like these shades for my skin tone and I think they will work well when I have a tan as well, I just wish they had considered anyone who has a deep complexion. I am a huge fan of the formula that Tarte uses for their powder products as it is always feels really soft and buttery. 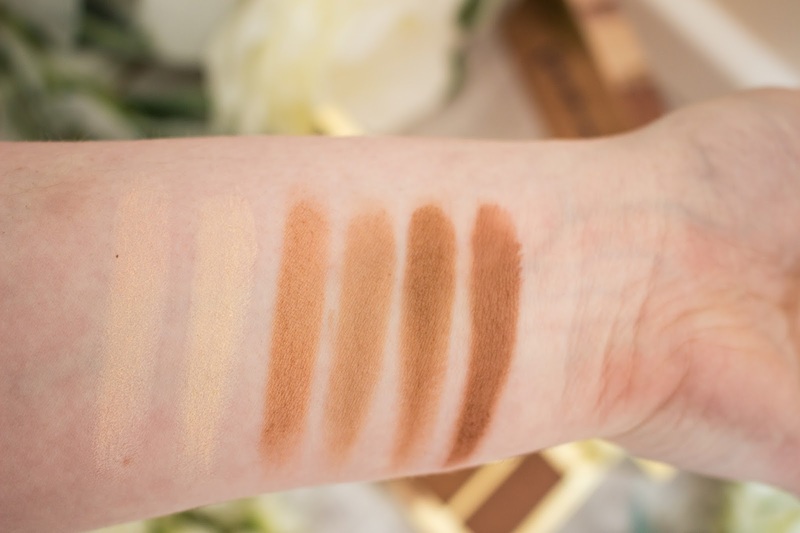 As well it always is easy to apply to the skin and they blend out like a dream and that is definitely the same case with this contour palette. When it comes to pigmentation, I do have other contour palettes that are a lot more pigmented but the fact that this is not as pigmented is a slight advantage - especially if you are not very confident in doing contour. I do find that whenever I apply one of these shades that the pigmentation is quite sheer at first, but that is perfect as it is easier to build up the pigmentation than trying to blend out a really pigmented contour shade. These do blend out beautifully and even if you do pick up too much product you can blend it out so it becomes a bit more sheer. I find that these are so easy to build up on the skin and I really like how each contour/bronzing shade just gives a healthy, natural and radiant finish to the skin without looking like I have too much makeup on. My skin tone will change constantly in the Summer months as I get more of a tan, so I love the fact that you can mix and match shades to create your own custom shade that will work well no matter how much of a tan I get. 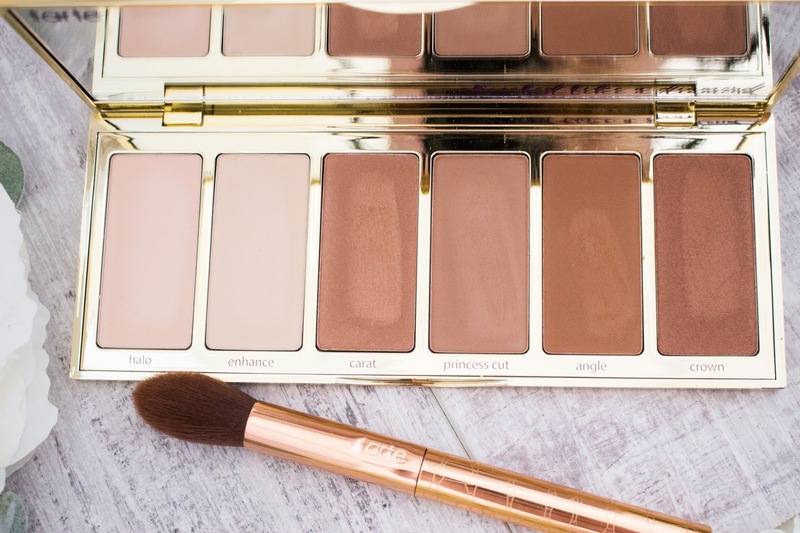 What I love about contour palettes is that they can double up for other products in a makeup bag - I use this palette to brighten my under eye areas, set my foundation, bronze, contour and I even use it as an eyeshadow palette. In the Summer months, I don't wear a lot of eyeshadow and I will usually always wear a bronzer on my eyes to just give me a beautiful natural bronze eye, without being too dramatic and this palette is perfect for creating that type of eye look. I did find that these powders last a long time on my skin and they will typically last anywhere between 8 and 10 hours. This is perfect for those long Summer days when I want my makeup to look amazing all day without it fading into nothing, as usually my contour will be the first thing to go when my makeup starts to wear off. I was really impressed with the longevity and I found that I still had a healthy glow to my skin when I was taking my makeup off at the end of the day. I also love how these powders wear on my skin, as they don't sit on top of the foundation, but instead seem to melt into the skin. It just looks so natural on my skin and I will admit that I prefer to use these as bronzers, rather than contours, as I find that these just give me a bronzed glow without looking too orange or muddy (although I love the shade Princess Cut to contour with, especially on my nose). Sometimes, powder products can look patchy on my skin but I find that when I use these powders they look even and have a softness to them, rather than looking too harsh. I can definitely see this working for all skin types, whether you have dry skin, oily skin, combination skin or normal skin. Overall, I definitely think this palette is worth buying; but only is you have fair to medium skin tones. I do think that Tarte should have created a palette that could work for medium to deep skin tones, as the highlighting shades in this palette will be way too pale for anyone with a deeper complexion and really the only shade available for a medium-deep skin tone is Crown which means you would be spending a lot of money for one one wearable shade. 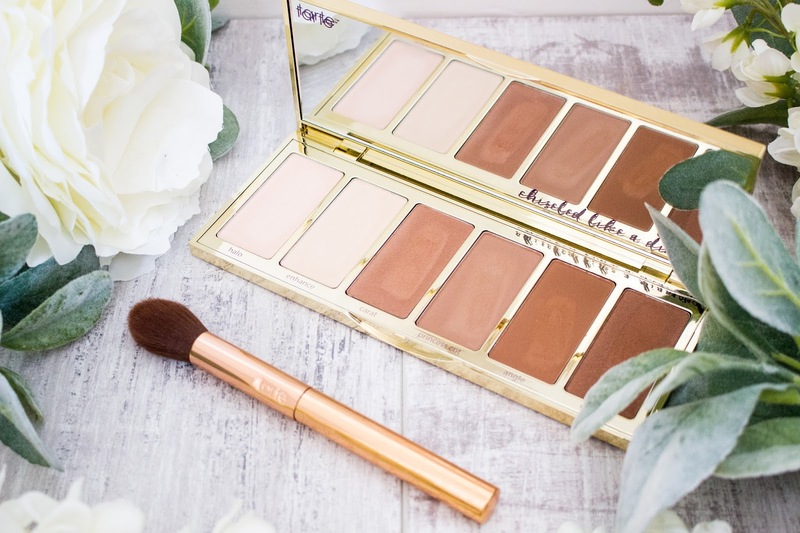 However, if you do have fair to medium skin tones then this palette is definitely worth purchasing as the shades are perfect for the Summer months to help achieve a bronzed Goddess makeup look and it just helps to give a natural, warm glow to the skin without looking patchy and muddy. This is one of my favourite contour palettes as it is so easy to blend out and it never looks harsh when I apply these powders to my face. I also love how the highlighting shades just brighten up my face but still keeping me looking natural. Even the shimmer bronze shades are not packed full of glitter and just give a glow wherever you put them on your face. I would definitely recommend buying this palette from QVC, if you are from the UK, as it is cheaper and you also get a great quality brush that is perfect for using to apply your contour. The brush is so soft and just picks up the perfect amount of product each time to create a soft bronzed look. 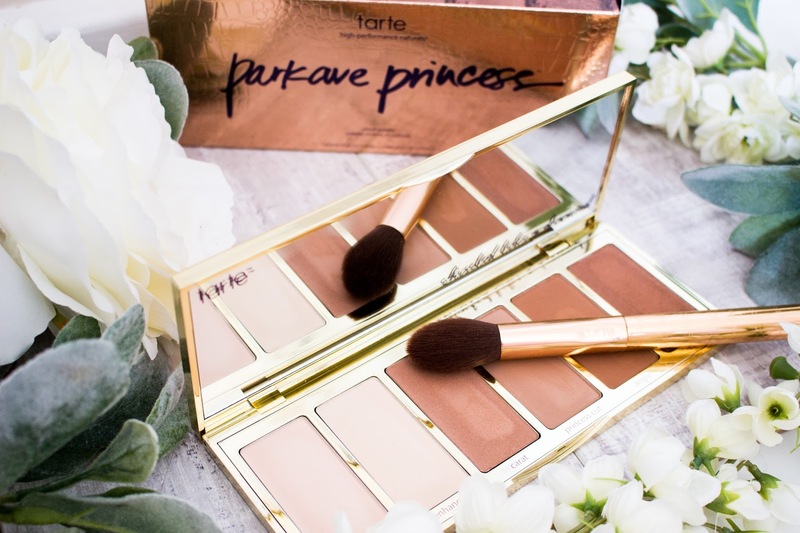 The Tarte Park Ave Princess Chisel Contour palette is available for £40 from Tarte or £33 from QVC. Let me know in the comments if you have tried this contour palette from Tarte? Also let me know what your thoughts of Tarte are? Are there any other products you would like me to review this Summer? This palette looks so nice but I definitely haven't felt the same about Tarte since the shade controversy. There is no excuse for releasing a product with such limiting shades.